The XVII Latin American Congress of Clinical Biochemistry / Congreso Latinoamericano de Bioquimica Clinica was organized by the Biochemistry Association of Paraguay (Asociacion de Bioquimicos del Paraguay, ABP) in Asuncion, Paraguay from 4-7th April, 2006. But, what were the reasons that transformed this congress into a popular and scientific success? A city of cultural diversity, a great opportunity for the venue of a regional congress. Asuncion, the capital city of Paraguay, is a pretty place with great architectural buildings (like the President's house and the Cathedral), close to the river Paraguay in South America. 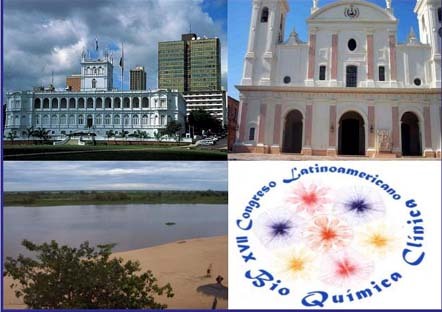 Therefore, Asuncion was an ideal place for the discovery of Paraguay history, nature, an old Guarani civilization, and this year for the venue of the XVII Latin American congress / XVII Congreso Latinoamericano de Bioquimica Clinica held at the Yacht and Golf Club Hotel, close to the Paraguay river, convening harmony between nature and science. A talented president, a motivated confederation. 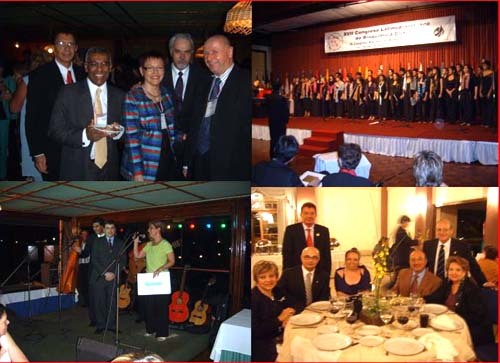 Asuncion 2006 was a success because of Prof. Maria Montserrat Blanes Gonzales and the Congress Organizing committee, who accomplished an enormous amount of work. "Montse", as called by her colleagues, was charged with providing a friendly and charming environment for the congress attendees which, together with Dr. Graciela Velazquez (Vice-president), Dr Francisca Gomez (President of the association), and Dr Esteban Ferro (Scientific Committee), was able to host a great event. The XVII COLABIOCLI (COnfederacion LAtinoamericana de BIOquimica CLInica) congress, represented by its president, Dr Norberto Cabutti, and its vice-president, Dr Ana Leticia de Masselli, is the link between central (Guatemala) and south (Argentina) "America Latina", that together with representatives from another 17 countries constitutes COLABIOCLI, an important region in IFCC. 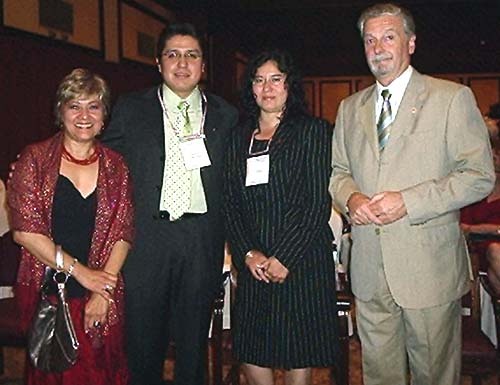 From left to right, Montserrat Blanes, Graciela Velazquez, Francisca Gomez, Esteban Ferro, Daniel Mazziotta and Xavier Fuentes-Arderiu. LEGEND: Jocelyn Hicks, President IFCC, Y.M. Dennis Lo, Abbott Awardee and Vladimir Palicka, Vice-president IFCC and Chair, IFCC Awards Committee. The Opening ceremony on Tuesday night was an opportunity for music fans to enjoy a homage to the 250th birthday of Wolfgang Amadeus Mozart by "el Orquestra de Cuerdas de la Universidad del Norte" under the direction of Diego Sanchez and great songs from the "Coro de la Opera de la Universidad del Norte" under the direction of Ana Maria Casamayouret. 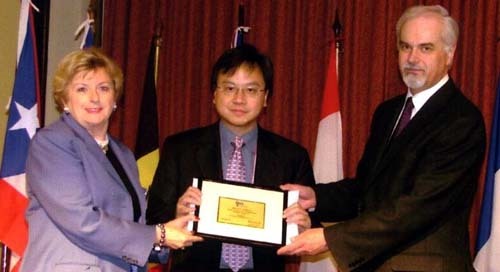 This ceremony was also the opportunity to present two important awards, the 2006 IFCC-Abbott award for significant contributions in molecular diagnostics to Professor Yuk Ming Dennis Lo from the department of Chemical Pathology, The Chinese University of Hong Kong, Prince of Wales Hospital, Hong Kong. And the Latin American Award sponsored by Weiner Lab from Argentina presented to Dr Rosa Elena Navarro Hernandez, from the University of Guadalajara, Jal. Mexico on "Polimorfismo de nucle�tido simple y niveles de expresi�n de E-selectina, VCAM-1, ICAM-1, en relaci�n con la actividad cl�nica en pacientes con artritis reumatoide". As well, Prof. Vladimir Palicka, in a special ceremony, gave the IFCC President's coat to Prof. Jocelyn Hicks. The Opening ceremony ended with a very nice firework display above the Rio Paraguay. The involvement of the international federation. Through out the congress week the active participation and interaction of the IFCC Board members could be appreciated. IFCC president, Dr. Jocelyn Hicks, IFCC vice-president, Dr. Vladimir Palicka and IFCC secretary, Dr. P�ivi Laitinen were wonderful. The IFCC flag in Asuncion showed the good relationship that IFCC has with COLABIOCLI. IFCC activity was also marked by a high level symposia of the Communications and Publications Division by A. Wootton, C. Webster, E. Jacobs and C. Sypniewska and the presentation of the IFCC divisions strategic plans by J. Hicks, M. Mueller (for Scientific Division), A. Wootton (for the Communication and Publication Division), G. Sanders (for the Education and Management Division) and D. Mazziotta (for the Congresses and Conferences Division). Additionally, other IFCC regions were represented; Prof. Victor Blaton, President of FESCC (Federation of European Societies of Clinical Chemistry) gave a plenary session on behalf of FESCC board members, and there were updates across the spectrum of Laboratory Medicine in areas such as in biochemistry biomarkers, laboratory accreditation and, cardiac and stroke markers. All of which were very well attended. The participation of colleagues from several countries in Latin America at this event, as well as from other regions of IFCC, allowed participants from around the world to interact closely. The gala dinner on Thursday night at the salon Perez Uribe of the Club Centenario gave to the congress attendees the possibility to dance on Paraguayan rhythms. 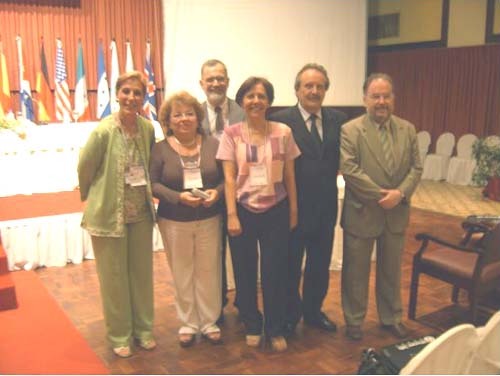 Asuncion 2006 was a great success for Paraguay and for America Latina Laboratory professionals. Moreover, at the closing ceremony it was showed that the congress scientific international program included the participation of speakers from 40 different countries who participated in 20 intra-congress courses, a Latin American Forum, 5 symposia sponsored by the in-vitro diagnostic industry, 22 symposia on different topics in clinical biochemistry, 7 plenary lectures, 8 workshops, and 2 selected topics sessions. Posters presentations were awarded by Lab-Ciencia to colleagues from Argentina and from Mexico. Another attractive tool was the congress exhibition under the coordination of Dr Miguel Beltran; the efforts of the diagnostic companies to develop attractive booths for this big event was recognized at the Closing ceremony with an award presented to BIOTEC DEL PARAGUAY S.R.L. We are convinced that the future congresses organized for the COLABIOCLI region in 2007 in Panama City, Panama, and the ICCC IFCC/SBAC 2008 in Fortaleza, Brazil will also be of great success.